What fun starting Christmas traditions with our new baby! 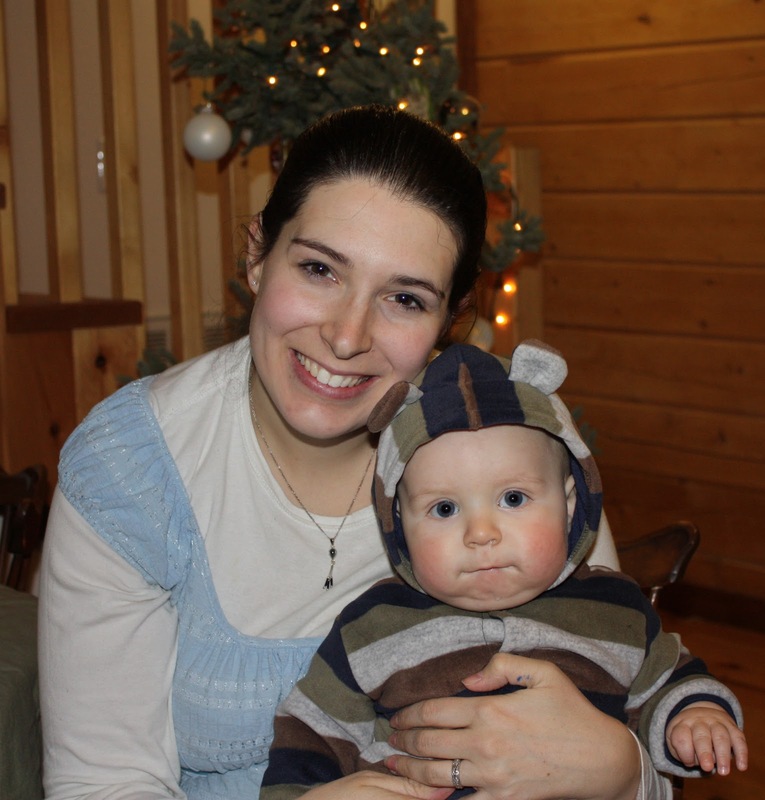 Josh got Friday off and we packed up sweet little Fynn and drove to North Pole to see Santa at his home. Since Fynn got croup on Wednesday night, car rides have been even more traumatic, but he held up like a trooper on the way there. Santa Clause's house was all aflutter and smelling of the amazing fudge, sweets, cocoa and coffee brewing. 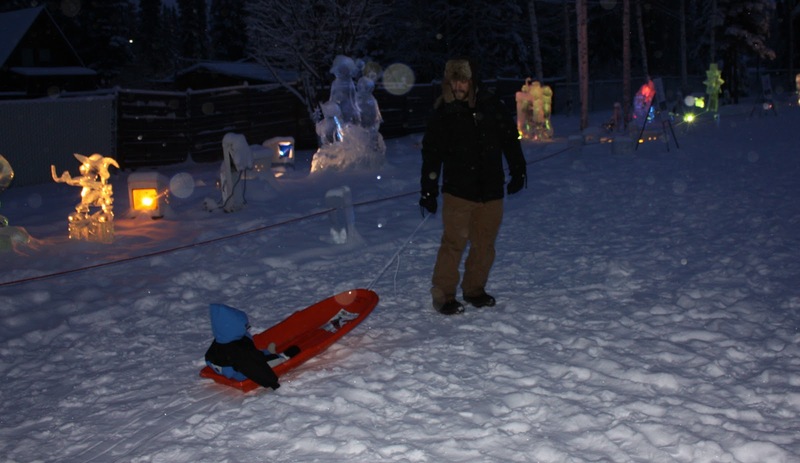 Santa was just getting ready to go check on the reindeer out back, so we walked over to the ice park to see this years sculptures and take Fynn down a slide or two. 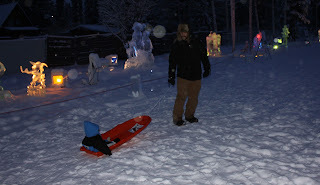 We pulled him out in a little sled and Josh took him down the big ice slide and I took him in the ice spinning bowl. He wasn't real thrilled, but tolerated our photographing. Then we went to meet the big man himself after sampling their homemade fudge and sitting by the roaring fire. I was worried that Fynn would be afraid (separation anxiety has begun to set in), but he was just cool as a cucumber! He actually does seem to be more okay with guys with beards than anyone else, now that I think about it! We read a couple of the letters to Santa posted about, saw the world’s largest Santa outside, and Josh and Fynn sat in Santa’s ice sleigh. Christmas Eve was fun, too. Mostly just hanging out around the house during the day, then a service at church that evening. I kept Fynn back in the sound booth with Josh to avoid spreading any of his croupy germs. The boys got their Christmas PJs and we hit the hay. Josh read Fynn The Story from his Bible book while Fynn intently listened. Then we made some cinnamon rolls and watched A Christmas Carol while Fynn napped. When he awoke, he had so much fun playing with all his new toys. So fun to see the joy on his face! We (I) decorated the gingerbread house I made with candy from our stockings and later that evening, had a 6 way video chat with my folks, brother, aunts, uncle, Grandpa, and cousins in Washington, North Dakota and South Dakota. Slightly chaotic, but it made me appreciate technology just for the ability to see everyone, if nothing else. Dinner was super simple, but yummy: ham, mashed potatoes, salad, sparkling pear and strawberry cider, and chocolate cream pie for desert. Fynn played with some Cheerios and ate homemade yams and rice with pears for dessert. Fynn was pretty wiped and fell asleep quickly after reading one of his new books. And now I’m listening to Josh pick some carols on his guitar as I write. What a fun season, but most importantly, what a reminder to be grateful for Jesus’ choice to come to give us hope! A merry Christmas to all, and to all a good night!